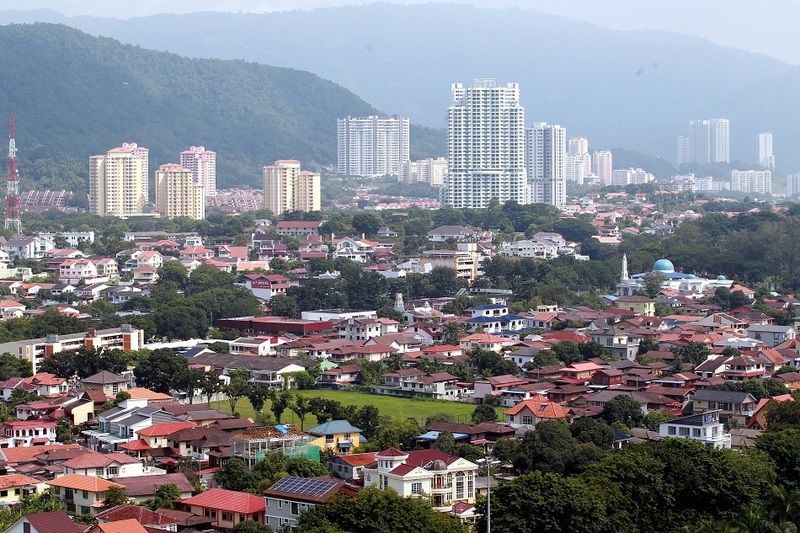 The Penang housing market moved sideways on both the primary and secondary markets in the first quarter of the year, says Michael Geh, director at Raine & Horne International Zaki + Partners. “I noted active transactions on the secondary market with prices staying flat,” he says in presenting the 1Q2016 Penang Housing Property Monitor. Banks, he adds, only provide loans of up to 70% to 80% of a property’s value and serious first-time homebuyers have to make up the difference in order to sign the sales and purchase agreement. “A few primary market projects have obtained the Advertising Permit and Developer Licence (APDL) and moved into the stage of processing loans from commercial banks and signing the S&P.” These projects include I-Santorini, SummerSkye and ForestVille, all under Ideal Group. 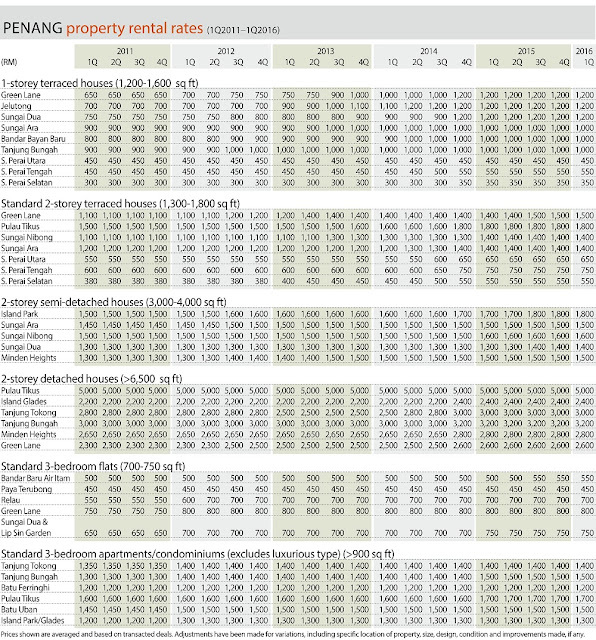 Will the prices of Penang houses, considered expensive, drop because of the soft market conditions? Geh says prices have come down to more realistic levels, especially with the government pushing the developers to build properties priced from RM300,000 to RM400,000 in the last two years, specifically for owner-occupiers. Some of these properties, in areas such as Sungai Ara, Patani Road and Relau, have been taken up and are currently under construction, he adds. Elsewhere in the country, some developers are pushing sales by providing financial assistance to the purchasers. Will those in Penang follow suit? He believes a catalyst for the state’s housing market would be the much-talked-about RM27 billion Penang Transport Master Plan (TMP). The ambitious plan will not only benefit the people but also bring about a more equitable housing situation and help retain local talent. The TMP, he feels, will lead to equitable home property prices as areas that are not in prime locations will become more accessible, boosting demand for homes and resulting in higher prices. Properties in prime areas, which normally fetch higher prices, should see some price correction as demand is more evenly distributed across the state. Apart from that, Geh opines that the TMP will help retain talent, which will subsequently impact the property market as the pool of workers seek to rent or own residential properties. “Penang needs the TMP to grow in the next 10 years. We need to stem the migration of youths to the Klang Valley, Iskandar Malaysia and Singapore in search of better job opportunities. We need to create jobs and make conditions more liveable for our youth to prosper,” he says. At present, two light rail transit lines have been approved under the TMP — one from Prangin Canal to Penang International Airport in Bayan Lepas and the other from Prangin Canal to Straits Quay. As for creating jobs, the state government is making a concerted effort to develop new business sectors so that Penang can stay relevant to the global economy. “An industry that has been highlighted by the state is the knowledge economy, such as apps and animation,” Geh says. This has been identified as a key economic sector for the next decade. There is a proposal for three reclaimed islands in the southern part of Penang island to locate businesses for this sector, he says, and for the islands to be connected by an LRT line that extends from Penang International Airport. However, it has not been plain sailing for the TMP because one of its components — the Sky Cab or cable car system — has been rejected by the federal government. The 4.8km cable car system, according to the Penang government’s TMP website, was to have connected Butterworth on the mainland to Jelutong on the island. While this is a blow to the state government’s plans, Geh does not believe it will affect property prices. “Cable car systems are generally more for tourists and not meant to move high volumes of people. I don’t think there will be a large negative impact on the property market. High-volume, high-frequency vessels that travel on water may be a better solution,” he says. Another component of the TMP is an undersea tunnel linking the island with the mainland. However, further details are not forthcoming at present. A development that will have an indirect impact on the Penang housing market is the much-debated Gurney Wharf. This 3km-long reclamation project lies just off the shores of popular tourist spot, Gurney Drive. The prices of landed properties did not rise much compared with those of high rises, the data compiled for the monitor reveals. This is due to “stagnation” as there were very few transactions during the quarter under review, compared with the high-rise sector where there was much more activity, Geh explains. Nevertheless, property values have increased compared with a year ago. For 1-storey terraced houses, some areas surveyed showed activity year on year but little movement quarter on quarter. On the island, properties in Jelutong showed the highest price growth, rising 5.88% to RM900,000 from a year ago, followed by houses in Tanjung Bungah (up 5.26% to RM800,000). Houses in Sungai Dua, Sungai Ara and Bandar Bayan Baru saw slight price increases of 2.56%, 2.04% and 1.96% respectively while those in Green Lane and on the mainland saw no changes. 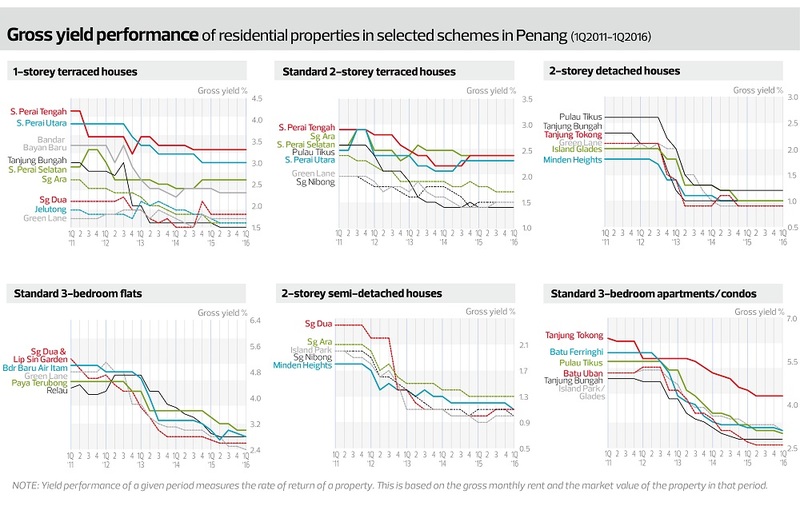 For 2-storey terraced houses, there was no activity q-o-q but prices rose y-o-y in some of the areas surveyed. The prices of houses in Pulau Tikus rose 6.67% to RM1.6 million, followed by those in Sungai Ara (5.26% to RM1 million) and Sungai Nibong (4.55% to RM1.15 million). 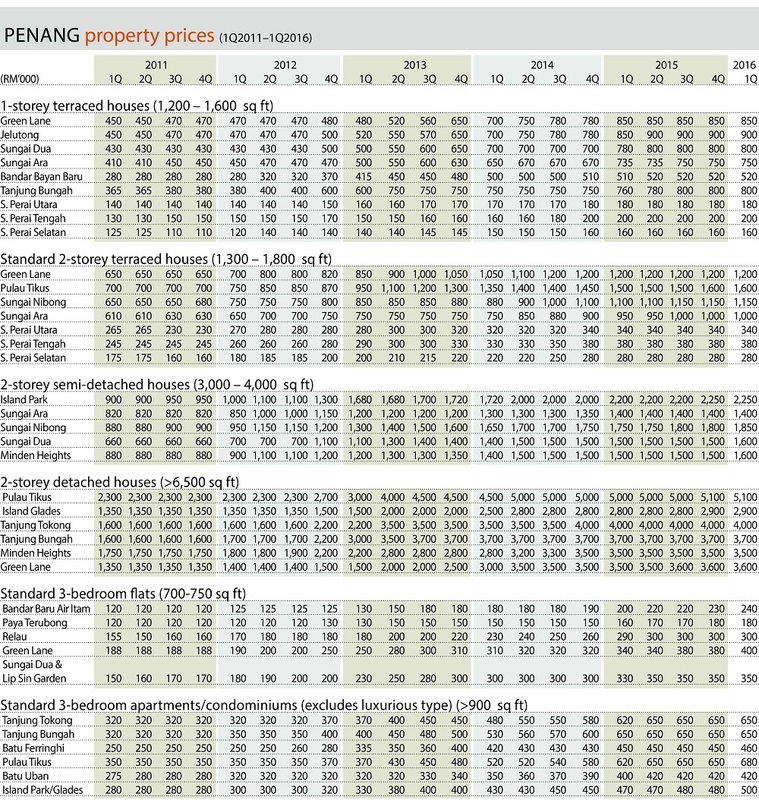 Prices remained unchanged in Green Lane and the mainland. The 2-storey semidees in some areas saw more activity in 1Q2016 than in the previous quarter and last year. 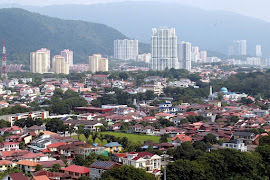 Prices in Sungai Dua and Minden Heights rose 6.67% to RM1.6 million q-o-q, followed by those in Sungai Nibong (up 5.71% to RM1.85 million) and Island Park (up 2.27% to RM2.25 million). Prices in Sungai Ara remained unchanged. There was no q-o-q increase for 2-storey detached houses but 50% of the units surveyed in the monitor saw y-o-y activity. Island Glades bungalows saw a 3.57% increase to RM2.9 million y-o-y , the prices of Green Lane houses rose 2.86% to RM3.6 million and Pulai Tikus houses were up 2% to RM5.1 million. 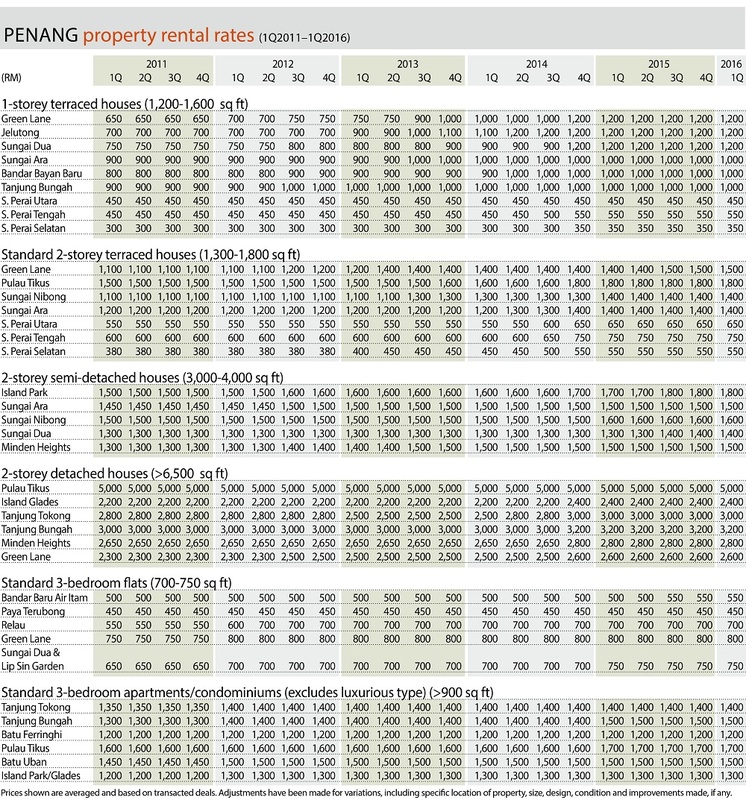 House prices in Tanjung Tokong, Tanjung Bungah and Minden Heights remained unchanged. 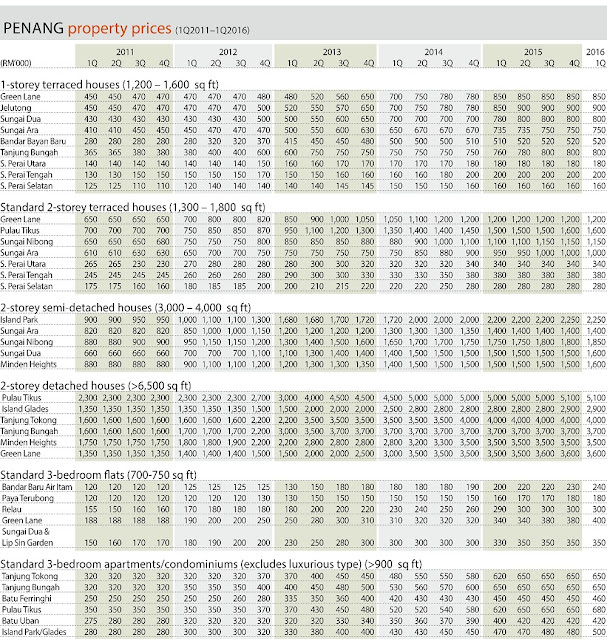 Three-bedroom flats in Green Lane and Bandar Baru Air Itam showed price increases q-o-q as well as y-o-y. 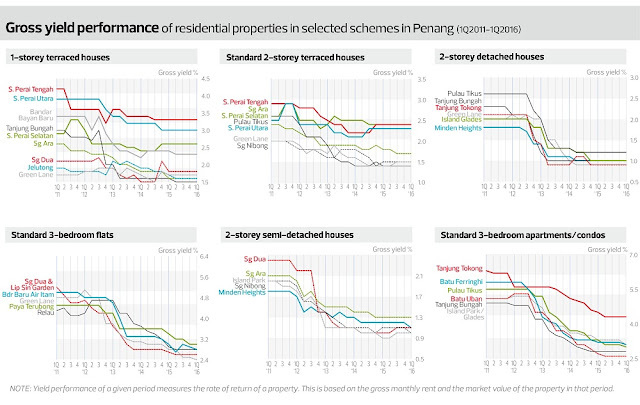 In Green Lane, prices rose 5.26% to RM400,000 q-o-q and 17.65% y-o-y. Units in Bandar Baru Air Itam rose 4.35% to RM240,000 q-o-q and 20% y-o-y. Compared with a year ago, the prices of flats in Paya Terubong were up 12.5% to RM180,000, followed by Sungai Dua and Lip Sin Garden (6.06% to RM350,000) and Relau (3.45% to RM300,000). Among the 3-bedroom condos, the biggest gainers were properties in Pulau Tikus, which rose 4.62% q-o-q and 9.68% y-o-y to RM680,000. In Island Park and Island Glades, prices rose 4.17% q-o-q and 6.38% y-o-y to RM500,000 while condos in Batu Ferringhi rose 2.22% to RM460,000 q-o-q and y-o-y.